Cover whole unpeeled potatoes with cold salted water, bring to a boil, cover & simmer until tender, about 20 minutes. While potatoes cook, combine dressing ingredients (except mashed potato). Drain potatoes. Cut off a small piece. Peel and mash about 3 tablespoons of potato with a fork until smooth and whisk into the dressing. Peel and dice hot potatoes into 1/2-inch cubes & place in a glass bowl. Pour dressing over hot, diced potatoes and toss. Let cool for 5 minutes and toss again. Stir in celery, onion, eggs, and parsley. 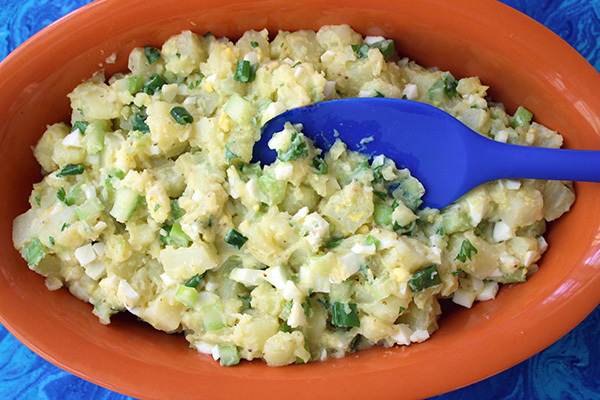 3 Comments on "Potato Salad No Mayo"
Just finished making this delicious potato salad. Tastes fresh, light and yummy!! Great recipe Jenny! Will definitely make it again. Ed and Jenny....a different but almost equally as good a cook !! As well , your no knead bread , mmmm mmm good and 50 C a loaf we think.